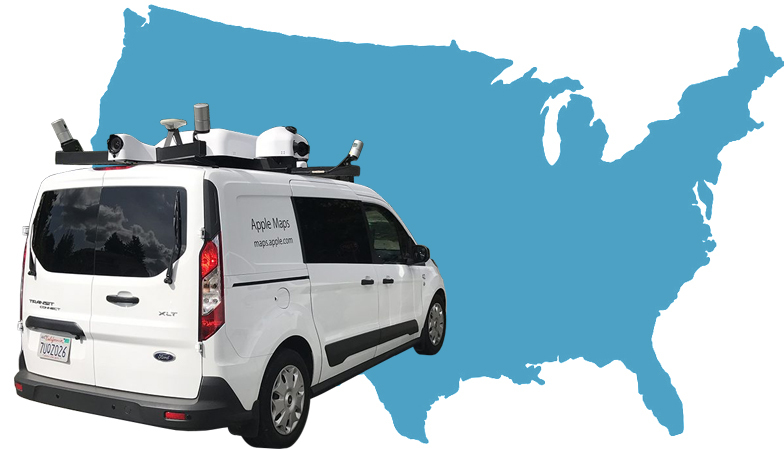 Apple Maps vehicles equipped with LiDAR sensors have begun collecting street-level data in Montana and North Carolina for the first time this week, raising the total number of U.S. states the fleet has at least partially covered to 45. The vehicles have been collecting mapping data in the United States since at least 2015. Apple periodically updates a list of locations where the vehicles will be driving on its website. To our best knowledge, the only states yet to be surveyed are Alaska, Arkansas, Oklahoma, South Carolina, and Tennessee. The vehicles have also surveyed parts of Croatia, France, Ireland, Italy, Japan, Portugal, Slovenia, Spain, Sweden, and the United Kingdom. Last month, Apple confirmed that mapping data and imagery collected by the vehicles will be used to rebuild Apple Maps "from the ground up," aided by high-resolution satellite imagery and "probe data" collected from anonymized, random segments of navigation sessions by opted-in iPhone users. The gist of it is that Apple will be switching to its own base map, reducing but not fully eliminating its reliance on third-party providers like TomTom, which will yield significant improvements to traffic, real-time road conditions, road systems, new construction, changes in pedestrian walkways, and more. The overall look and feel of Apple Maps is mostly the same, but zooming and panning reveals more details like grass, trees, and parking lots. Apple also says search results should be more relevant, hopefully making navigation more reliable. 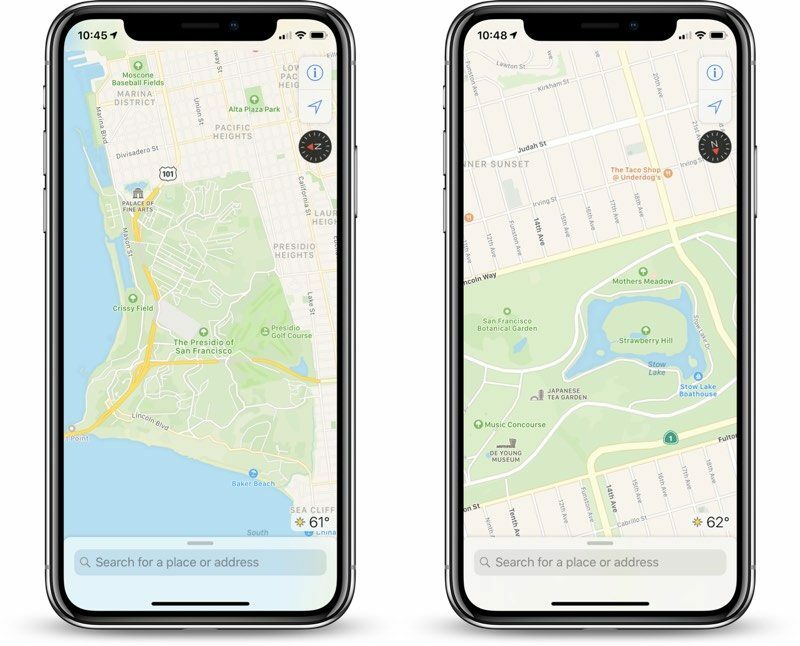 Apple says the underlying efforts to revamp Maps have been underway for the past four years, but the improvements are currently limited to Northern California on devices running the iOS 12 beta. Apple says the new Maps will roll out section by section across the rest of the United States over the next year. Apple hasn't said if and when the new Maps will be available outside of the United States, but given the vehicles have surveyed 10 other countries, it is likely on the roadmap. We've reached out to them to see if they are willing to confirm. Just checked an area of Marin county on my iPad with iOS 12 Beta on it -- definitely has more detail in the spots I checked. Sure, this is a cherry picked spot in an area where it looks like they're focusing their efforts -- but I think we can see there's steady improvement. And even the current non-improved version is a lot more useful than Google's. Looks like Apple maps is getting long overdue overhaul, up to date and more accurate. I use Apple Maps for everything except for long-distance travel. This might change things Where I’d feel comfortable using it solely. Used Apple Maps for a 2,000 mile road trip last year on the East Coast and South of the US, and it never let us down once, even did tons of rerouting through secondary roads to keep us out of traffic on the highway. I know it's less strong outside the US, but I find it very reliable here. Honestly the weakest points in Apple Maps are search-related -- it returning a dumb, far-away result instead of something that's less than a mile away. But other than that, routing is very solid and transit options have gotten quite good where I've used them. And yeah, privacy, like you said. I would love to see the Apple Maps van take on the Dalton Highway to Deadhorse, AK. Of course, we must grasp that when this finally gets to 50+, the job is not done. This is an ongoing, forever task. Roads change. New roads are built. Old roads are closed. Etc. I think getting serious about maps data is terrific after so many years, but I hope these vans multiply and are on the roads for years to come. If 50 becomes some claim to “mission accomplished,” this data will go stale just like the existing data. They were in my neighborhood! Looking forward to it. Hopefully they also have street view data that they will fold in. Something they really need to work on is search within maps. Maps directions seem to work well and get me from place to place, but the issue I have is when searching for something that I don't know the name of. A recent example is searching for flooring stores and office furniture stores. I get some results, but Google has a lot more. It's like Apple Maps mainly searches business names while Google has metadata about what different stores actually sell. This is extremely useful for any sort of maps app. Yes, I understand that. I thought it was obvious from the article context but for clarity I'll restate: Apple isn't even mapping all contiguous 48 states THEMSELVES yet?!? They started collecting their own map data YEARS ago. We're beyond the testing stage so buy more vehicles and hire more drivers Apple. I see no reason why they seem to have 2020 as a target for complete better map data in the States and even later elsewhere. That’s not true though...they’ve got the most difficult areas where roads are changing constantly and where traffic/construction are huge factors. Alaska is not one of those areas. It’s not like they still have to do CA or Chicago or NYC. And they are already mapping the UK and other countries...it says so right on their own website. Honestly, my biggest complaint with Apple Maps is that the labels are really small, and they stay small even when you zoom in. On the Mac there's an option in Maps to use larger labels, which helps a lot - but said option is not available in iOS. While I know you can go to the Accessibility settings an increase the font size for compatible apps, doing that causes the entire system and nearly every app to have bigger fonts, which is just annoying. At the moment, the label size doesn't seem to have changed any in iOS 12. I've submitted a feature request to Apple about this (multiple times actually), but doesn't seem they have an plans on changing this. Apple doesn't seem to understand the problem with apple maps vs google. What I like about google is that their maps and most importantly, the search functionality is very intuitive. I could misspell a place and it will figure out what I am talking about. Whereas, Apple's maps remind me of the old GPS units, where you had to literally type the exact address or legal namer of the establishment otherwise, it would not show up. I think that’s exaclty what the article is saying. They’ve been dependent on TomTom, an old-school gps as their base data, and now they’re switching to doing it themselves, in a hopefully better way. I hope they redo Florida. I recently moved from the DC Metro area where Apple Maps is quite good and accurate. In Florida, Apple Maps is horrible. Missing roads, wrong roads, missing roundabouts. Absolutely horrible.